Altitude: 0-500(-800) metres above sea level. Habitat: Copiapoa taltalensis grows in open areas in the coastal desert of Taltal, mostly on rocky slopes but extending to the edge of the desert in sandy soils, with protection from direct sun through coastal fog (camanchaca). They obtain water mainly from condensation of the fog, they only manage to survive in those conditions. The succulent vegetation found in this area is particularly interesting and comprises endemic species such as Eriosyce odieri subsp. malleolata, Eriosyce occulta, Copiapoa cinerea, Copiapoa columna-alba and Copiapoa krainziana. Description: Copiapoa taltalensis is a perennial geophytic succuculent with rounded stems arising from a large tuberose root. Habit: It is solitary, or sprouting very sparingly from the base to form large clump up to 50 cm tall. Stem: Globose to short cylindrical, 5 to 15 cm or more tall, and 5 to 10 cm in diameter, pale green or olive green eventually lightly tinged with brown in the sun, globular flattened in the young plant, later columnar, crowned by a dense mass of silky brownish wool, particularly at flowering time. Ribs: 10 to 17 prominent, not wavy, divided into large tubercles about 7 mm high. Areoles: Round covered with white or brown felt up to 1 cm apart. Spines: Straight or slightly curved, white to yellow to brown to black (later grey). Radial spines: 7-12 about 2 cm long. Central spines: 1 to 6 stronger and more than 2 cm long as well. Flowers: Diurnal closing at night, protracting the period of opening many days and arising on the crown, often several at a time, nearly hidden in the dense wool. They are glossy, pale yellow or reddish, with broad limb, 3,5-4,2 cm long and up to 5,5 cm in diameter, and with a faint scent. The filaments, anthers and style are yellow, the 7 to 12 lobed stigma darker. The ovary measures about 1 cm across. Fruits: Globose to ovoid scaly. 2) Schulz R., (2006) “Copiapoa 2006” Schulz Publishing. 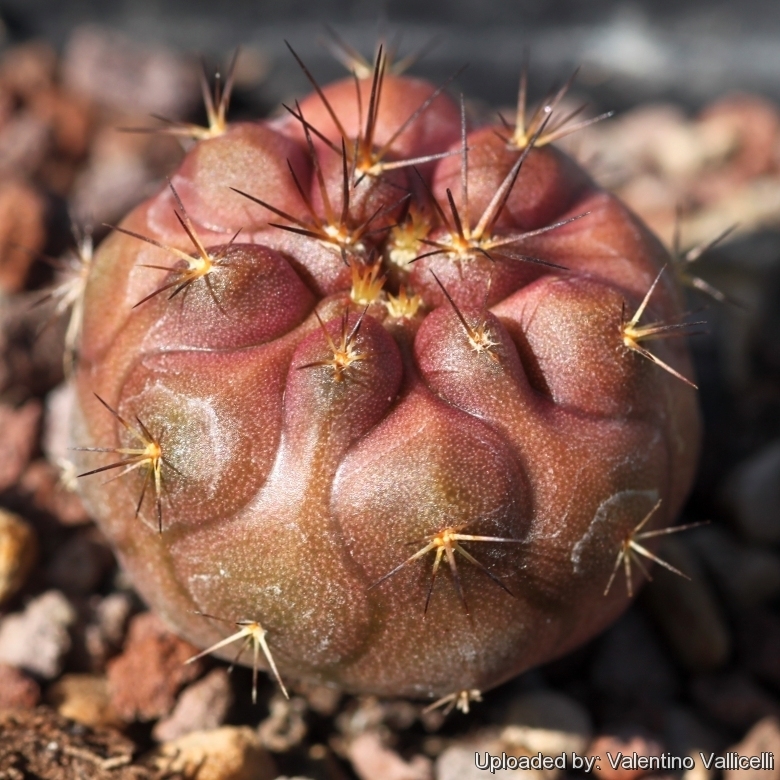 Cultivation and Propagation: Considering that Copiapoa taltalensis comes from a habitat with an extremely arid climate, they are remarkably tolerant of pot culture. These plants have taproots and are susceptible to overwatering. They requires also an appropriate air circulation. Copiapoas are summer grower species easy to cultivate.